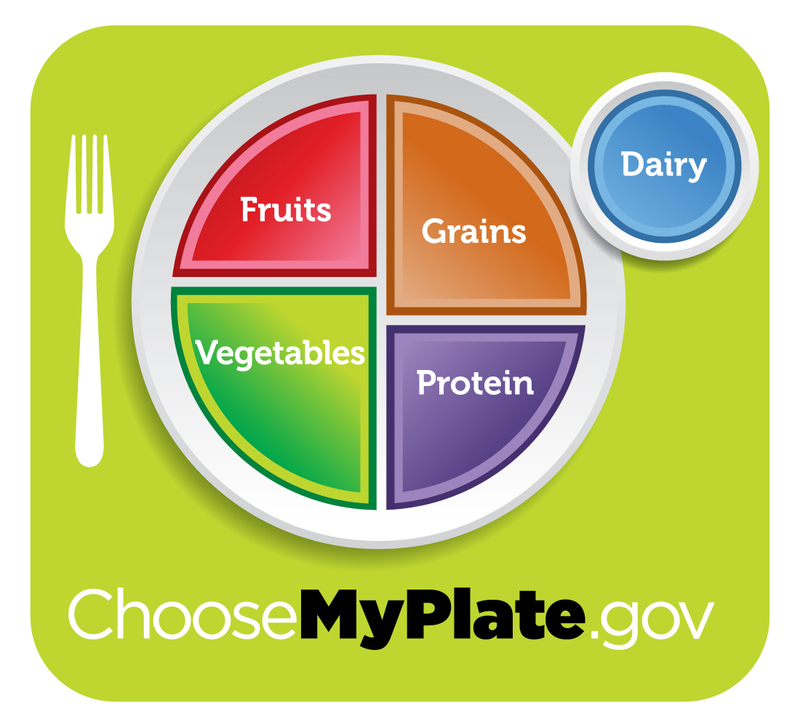 The United States Department of Agriculture replaces the iconic “food pyramid” with a plate, in hopes of making it much more clear what healthy nutrition is. We all know it, even those of us outside the US: A pyramid with grains as foundation, followed by fruits and vegetables, dairy and meat and, finally, a tiny bit of fats and sweets to make the top. Originally it had been invented in Denmark, but it was only after the USDA adopted the design, that it was spread throughout the world. And ever since it did, hot debates ranged around why and where what should and shouldn’t go into it. Of course, the new design has its critics. Dr. Marion Nestle told the New York Times that she finds labeling a large section of the plate with “protein” confusing and unnecessary, while various other commentators complained about too many carbohydrates in it and no respect for glycemic loads. In other words: Experts and so-called experts are jumping out of the ditch, some at least in what may be an attempt at furthering a personal agenda. But the specific points they make are beside the question; the plate may not be perfect, but for many people following it should be an improvement over what they previously ate. Or won’t it? Will the people for whom this plate is intended find it easier to understand than the pyramid? Which design do you find easier to understand? Pictures courtesy of Sam Mugraby / photos.8.com and United States Department of Agriculture. I think people who didn’t understand the pyramid won’t understand the plate either and shouldn’t have children. That is, well, rather harsh. These children can always educate themselves about nutrition, I know I did. Yeah, I think they tried to balance somewhere simplicity and conveying as much information as possible. Did they succeed? I don’t know. dairy doesn’t = protein? boy have i been doing it wrong..
That puzzled me as well. Also that it looks like a glass sitting beside the table led me to think this is supposed to be the acceptable berage. And that labeling it with “dairy” meant you supposed to only have milk with food. However, when you click the interactive graphic on their homepage, the “dairy” entry means everything dairy: milk, cheese, yoghurt etc. And it would be rather difficult to drink cheese.
.) I like that plate, it structures how a meal ‘should’ look like and gives people a good base to start with. Also, by just using general terms they don’t necessarily limit people’s choices, making diet adherence a lot easier. Sure, it doesn’t exclude a burger from McDonalds, which contains of both, protein and carbs, doesn’t it? But, “what exactly is protein?” – people might be thinking a lot more about nutrition (maybe/hopefully). What is a good source of protein? What are good grains? Maybe at least some folks start thinking about such stuff. This, on the other hand however, could lead to a failure of this graphic as well – laziness is strong and if you don’t tell some people everything they want to know they won’t follow you.
.) I don’t understand why experts are so much against higher amounts of protein. Most of our body consists of protein and besides, protein has been shown to be the best nutrient for losing weight due to its long term satiation properties as well as for its high thermic effect. Besides, all different kinds of protein sources come with a lot more valuable stuff. Meat, for instance, is an excellent source for minerals and that eggs are awesome is something I don’t need to mention.
.) The plate lacks one important thing. Fat! The pyramid has at least some fat in it but the plate doesn’t even suggest it at all. Sure, your protein or dairy source could contain fat but we all know that the world suffers from a fat phobia and it’s stuck in people’s head to avoid fat. Not mentioning it probably just deepens that thought. Very very disappointing, especially since there is so much focus on Omega 3 recently (at least I get to see way too many products showing off how much Omega 3 they contain).
.) About the dairy thing, I don’t think it’s necessarily limited to a glass of milk – this could mean a yogurt as a dessert afterward or maybe enjoy a bread with some cheese on top after a meal. The plate unfortunately doesn’t make it clear that you can combine different sources and even though it’s somewhat logical some might be thinking that you need to get 5 different types of food with each meal. Don’t understand why dairy is so small but well, I don’t think it’s just about a glass of milk either.
.) In conclusion I’d say that you can’t really tell whether the plate is better or worse than the pyramid. I think could be a first step in educating people about nutrition and suggests a good meal structure (I mean 11 servings of grains suggested by the pyramid?? That could mean 11 times spaghetti with all kinds of sauces a day) and is more general. Still, it lacks a lot of things, especially fat and it leaves many questions open. Like the pyramid it sure was made with a good will and I will always endorse such things but it definitely needs a lot of improvement. Nino, thank you for this very well thought out comment! Well, its pretty obvious. By protein, they are not referring to the nutrient. They mean a food such as chicken, beef, or tofu. It’s obvious that it’s far easier to picture what your plate should look like, when it’s shown as you’re actually going to see it. I think though that it would’ve been better to have pictures of the better food choices instead of just some weird colors. The biggest problem in terms of health with the USDA:s recommendations is that the main motives of USDA are not in just health. They are an organization that also needs to keep the production of the food in mind. This is best seen in the way that they’re endorsing large amounts of grains. Grains can be okay, but there’s really no reason health-wise to have a lot of them in the diet. You’ll get plenty of carbs and fiber from veggies and tubers which have much much much more vitamins, minerals and all that good stuff. Also veggies and tubers don’t have the phytic acids, lectins and gluten that grains do. Grains are though easy and cheap to produce in large amount, and therefor something to be endorsed by organizations like USDA, who need to keep this in mind also. On the other hand it’s good to see that they’ve decreased their grain recommendations and are also going easier on the fats. This is a step to the right direction both in terms of health and understandability. Kael, I echo that sentiment and we are not alone. In an article talking about “MyPlate” as well, Andrew Wilder of eatingRULES said about food subsidies in the US: “(…) right now less than 1% of subsidies go towards whole, fresh fruits and vegetables. If the subsidies shifted so that we subsidized these to the same degree we subsidized corn and soybeans, we’d be seeing a huge shift. Fruit and veggie prices would go down considerably, junk food prices would go up considerably, and there would be an enormous change in our priorities”. I got an odd ball question and I don’t know where to ask it here so I am taking a chance. I was recently told that I needed to add in more dark green veggies to my meal plan to help clean my colon so I can lose weight. I am wondering is if the colon cleaning really needed or would is it more bro science? Thanks again Evil for all the great work you do. Heah Yucca, if you have a normal digestion, meaning you regularly use the bathroom to get rid of the waste products, your colon is working exactly as it should.